Geographical Range: North America, Alaska, northern Mexico. Habitat: coniferous, and mixed forests, open tundra, rangeland, and deserts. Diet in the Wild:entirely vegetarian, evergreen needles, tree bark, buds, tender twigs, roots, stems, leaves, flowers, berries, nuts, and other vegetation. Porcupines are also known to gnaw on bones and antlers from the ground due to their high mineral content . Solitary, but some may den together in the winter. The front feet have four toes while the hind feet have five toes. Each toe has a strong curved claw this is an adaptation to help the porcupine in his forage for food. 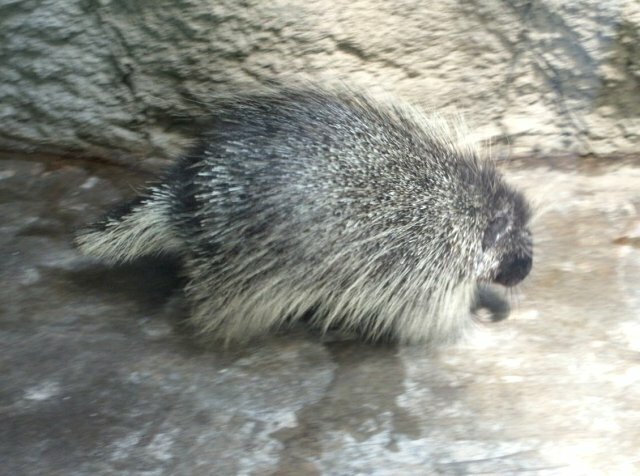 Because the porcupine cannot run fast nor appears very intimidating in size or appearance another special adaptation of the porcupine is its quills which are to help the porcupine defend itself from wouldbe predators. 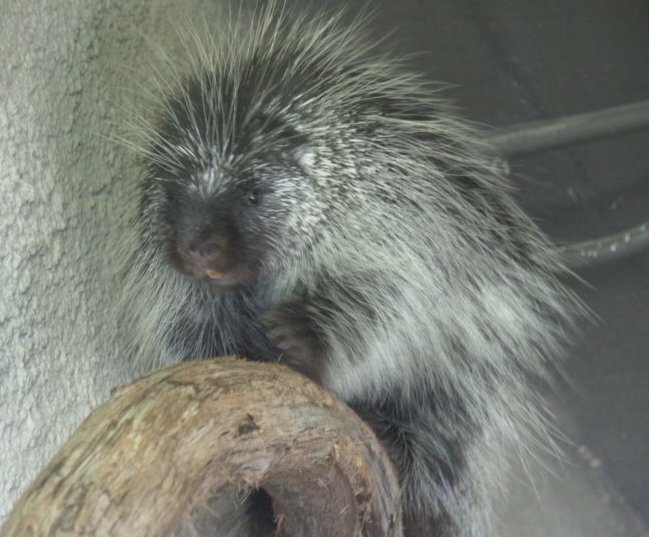 The number of quills on each porcupine may exceed 30,000. Each one of the modified hairs is tipped with microscopic barbs that cause the quill to be continually driven into the muscle of predators. The longest quills are located on the animal's rump; the shortest are found on the cheeks. Females become mature at about 18 months. A very interesting and detailed courtship takes place involving extreme vocalization, a very elaborate and somewhat comical dance, and then after the dance the male showers the female with urine. Females bear single precocial offspring, or rarely, twins, after a gestation period of 7 months. 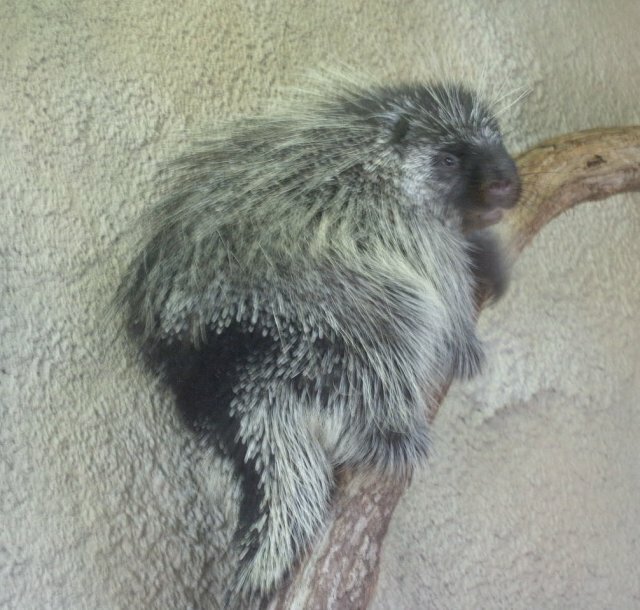 The porcupine at the zoo is a new addition to Texas Wild, however many people are not aware that he is a porcupine because he is not yet labeled. He is kept in with the ringtails and they seem to be fine at ignoring eachother. They even bunk close together at times, the porcupine on the log and the ringtail under the log. I have seen very little movement from the porcupine because he is nocturnal so he is always asleep during the daylight hours, in fact I have never seen him in any other place but on top of the log.